Venus Express was the European Space Agency's first mission to Venus, the second planet from the sun. The 2,800-pound spacecraft spent eight years circling the shrouded planet, watching long-term trends in the atmosphere and using instruments to peer below the clouds to the surface. Its mission concluded in December 2014 after the probe ran out of fuel. The orbiter found some surprising things, such as the presence of auroras without a magnetic field to sustain them. Additionally, it has watched over a bizarre vortex swirling around the south pole of Venus. In 2001, ESA issued a call for proposals for new missions based on the configuration of its Mars Express spacecraft. Mars Express was ESA's first independent mission to another planet. Despite the loss of its lander, Beagle 2, the orbiter has been a great scientific success since arriving at the Red Planet in 2004. Advisory bodies suggested three possibilities: Venus Express to focus on Venus, Cosmic DUNE to probe cosmic dust between the planets, and SPOrt Express to look at the polarization of the universe's cosmic microwave background (or evidence of the Big Bang). After some detailed technical studies, the ESA space science advisory committee recommended proceeding with Venus Express. As outlined in an ESA bulletin, Venus Express's core would heavily borrow concepts from Mars Express, although there would be some changes to help the Venus mission cope with the harsher radiation environment at that planet. To save on costs, the instruments would mainly be based on Mars Express or Rosetta flight spares. Thanks to these cost-saving measures, Venus Express only cost $110 million (85 million Euros) when it was launched in 2005. By comparison, the orbiter part of Mars Express was $195 million (150 million Euro) in 1996 dollars. Just 80 minutes after launch, the rocket's upper stage fired to put the spacecraft on track to intercept Venus several months hence. Venus Express arrived at its destination on April 11, 2006, after jetting about 250 million miles (400 million kilometers) from Earth. The spacecraft fired its engines for a planned 50-minute burn to insert itself into orbit. Controllers determined the spacecraft was in the right spot, and prepared it for several more maneuvers to put it into its final orbit in May. The spacecraft's prime mission would be 486 Earth days long, which is the length of two days on Venus. The planet has by far the slowest known rotation in the solar system. Because it's so sluggish, Venus can't generate a magnetic field such as the one we have on Earth — even though the two planets both have metal cores. Venus presents a challenging environment for landing spacecraft because it's so hot. At 870 degrees F (465 degrees C) at the surface — hot enough to melt lead — spacecraft that have made it to the surface have died within minutes. From above, orbiters must pass through intense radiation over and over again. Also, the clouds that trap the heat on Venus make the planet impenetrable to visual observations. To get information, Venus Express used instruments capable of imaging over wavelengths ranging from ultraviolet to infrared. It also had a plasma analyzer, a magnetometer and a radar sounder to make measurements and observations of the atmosphere and surrounding environment. The spacecraft sent back its first images to Earth rather quickly. Two days after entering orbit, ESA announced Venus Express had imaged the south pole of the planet — a first for a spacecraft. The researchers, ESA noted, were "intrigued" by a vortex swirling around the pole that was similar to a vortex already known to be funneling around the north pole of Venus. In June, ESA said Venus Express found a "double-eye" atmospheric vortex at the south pole. Scientists were not sure why this was happening, but emphasized it was early in the mission and they may figure it out with time. In 2011, interest concerning the double vortex deepened when Venus Express showed its shape changes at least once a day. Sometimes it appears as the number 8 or the letter S. Scientists speculated that air falling from currents across the meridians, and to the poles, might be driving the vortexes. Venus Express used a different technique that gave information about the surface. In 2006, researchers were able to sense heat coming directly from the planet's molten crust. Infrared heat is able to pass through certain "windows" in the planet's atmosphere and escape into space, where the spacecraft picked up its signature. Researchers thus were able to produce the mission's first extensive temperature maps of Venus' southern hemisphere. By September 2007, Venus Express passed 500 days in orbit and was starting an extended mission. Despite the intense radiation environment around the planet, the spacecraft was in good shape and beaming back new information about the rapidly changing atmosphere. New observations at the time showed that there are shifts every day in Venus' air currents. Further, scientists discovered a new isotope (or type) of carbon dioxide believed to play a role in Venus' greenhouse effect that keeps hot temperatures raging on the surface. Venus Express took this thermal view of Earth during an infrared observation with its VIRTIS instrument. The planet appears almost 'fully illuminated' with no difference from day and night regions since only the thermal radiance is seen. The Antarctica region, being colder, generates a weaker signal. In later years, Venus Express sought evidence of volcanoes (through searching for a common volcanic output, sulfur dioxide) and monitoring strange phenomena such as a hurricane that changes shape often. 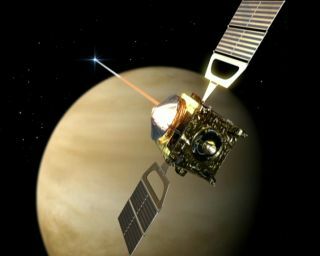 It used an "aerodrag" technique to push its solar panels against wisps of Venus' atmosphere, to obtain more accurate measurements. Additionally, the spacecraft found evidence of an ozone layer in Venus' atmosphere similar to the one on Earth. In March 2012, Venus Express was temporarily blinded when a huge solar storm blanketed the spacecraft in more radiation than usual. Its startracker cameras, which helped the spacecraft stay in the correct orientation in space, were unable to see any stars. The glitch had happened before, but the strength of the storm kept the spacecraft blind for more than 40 hours — far longer than usual. However, Venus Express recovered and continued observations. Only one month later, researchers found that Venus is likely generating auroras even though the planet does not have a magnetic field. This helped to explain some strange nighttime lights on Venus that spacecraft had spotted for years. It has been established already that Venus does have a "magnetotail" that happens when particles from the sun hit its ionosphere, which is a part of its upper atmosphere that contains electrically charged ions. With Venus Express, researchers found a magnetic reconnection within the tail that created a large, magnetic plasma bubble some 2,100 miles (3,400 km) wide that stayed for 94 seconds. Between June and July 2014, Venus Express underwent a daring “aerobraking” campaign in the upper atmosphere. The goal of the study was to learn more about the properties of the atmosphere. This was interesting to controllers both scientifically, and to help them design future spacecraft to visit Venus and perhaps land on it. It was unknown at the time if Venus Express would survive the maneuvers, but the spacecraft pulled through. Controllers attempted to use its fuel to raise it to a safer level above the atmosphere, but maneuvers came up short in November when the spacecraft stopped responding to commands. By December 2014, controllers said the mission was over and added that the spacecraft would likely break up naturally in the atmosphere in January 2015.